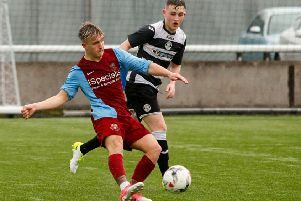 Lothian Thistle winger Liam O’Donnell is confident they can do the double on Tranent to boost their slim hopes of a top five finish in East of Scotland Conference B. Hosts Tranent will be eager for retribution just a week on from last week’s meeting at Saughton Enclosure, which saw Lothian run out 2-1 winners thanks to first half goals from Dylan Moore and Jamie Docherty. Raymond Carr’s side, who have been dominant in the East of Scotland League for several years and just narrowly missed out on the championship last season in a final-day title decider with Kelty Hearts, face an uphill task to secure a top-five spot and a guaranteed placed in the top division next season after being granted their SFA licence in August. Lothian currently sit ninth with three matches remaining and are four points off fifth place Crossgates who have a game in hand, but O’Donnell insists they have the belief they can do it. “It was a good result considering we only had 11 fit boys and our two centre halves were out [Connor McGregor and Grant Munro], I think we did well,” said the 25-year-old on last week’s match. “We had to reshuffle a wee bit and bring in a couple of the 20s boys. 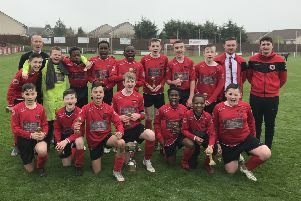 “To be honest, considering their [Tranent’s] league position, I thought they were going to be a right good side, but I thought we were brilliant. I always say to the boys before the games that we can get a result if we put our mind to it, and we did on Saturday. Hopefully we can do the same again tomorrow. O’Donnell is used to enjoying success at the club, so this season has been particularly tough. Losing key players in the summer, including Scott Taylor MacKenzie to Kelty and Louis Swanson to Bonnyrigg Rose, didn’t help, but O’Donnell feels the players only have themselves to blame. He continued: “This season has been difficult considering what it was like the last two or thee years, definitely. I think we only lost one game last season in the league [just pipped to the title by Kelty Hearts] and we’ve lost nine this year. It is difficult to take. “We lost a few boys from last season and it’s been hard to replace with teams who have got bigger budgets. I have enjoyed it, but it has been difficult. “We just have to try and promote the young boys – I don’t think Lothian have got that big a budget – but we could definitely attract players because of the name. “I thought that we would’ve done a lot better. At the start of the season it was poor, and I think a lot of the boys have underperformed, myself included; I don’t think I have performed to the levels I had the last couple of years. It is down to us as players to fix it the remainder of our games and hopefully get into the top five. “The last couple of years when we have played the sort of bigger sides we have beaten them. I just think that with losing a couple of boys, we haven’t replaced them with that sort of quality that we had before. We’ve only got ourselves to blame, there has been games that we’ve not performed when we should’ve and we’ve beat off the likes of Burntisland who we would never have got beaten off before.